DiRT Rally 2.0 is the next installment of the best-selling racing game series, which allows you to take part in rallies. 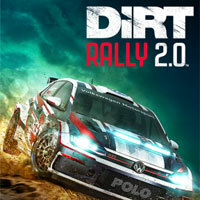 The game was prepared by the British studio Codemasters, which has been developing the series since its inception. DiRT Rally 2.0 is the next installment of the series that allows you to take part in virtual rallies. The game is characterized by a very high level of realism. It is the responsibility of experienced developers from Codemasters, who have been consistently developing the cycle since its inception. DiRT Rally 2.0 is a realistic rally simulator. The game gives us the opportunity to drive one of the dozens of well-known off-road vehicles (e.g. VW Polo GTI R5, Mitsubishi Lancer Evolution X, Citroen C3 R5, Chevrolet Camaro GT4.R) and compete for the title of the best driver. The game also allows you to run your own team - including hiring employees and developing your garage. A demanding driving model takes into account factors such as road surface, weather and even gravel, which accumulates on the tires, affecting their grip. Real-world support systems such as traction control, track stabilization and ABS help players in their efforts. Cars are also damaged while driving and may even refuse to obey altogether. All vehicles can of course be tuned, adjusting the specific parameters to your expectations. A high level of realism means that success or failure can be determined by one mistake. There are many special sections waiting to be covered, located in various corners of the world: in Spain, Austria, Argentina, New Zealand, the United States and Poland. The production of the Codemasters team is fully licensed by the FIA World Rallycross Championship. In DiRT Rally 2.0 we can play both alone and in company. There are several different modes at the disposal of the players – we have the possibility to take part in the World Rally Championship, play single rallies, and compete with other players thanks to the extensive network functions. Three-dimensional DiRT Rally 2.0 graphic design presents a very high level of quality. Both locations and vehicles have been mapped with attention to detail. The lighting system, realistic weather effects and mechanics responsible for vehicle damage and dirt are also very impressive.